ESATAN-TMS 2018 is now available to download from our website. ESATAN-TMS provides a high-productivity and powerful thermal modelling environment, supporting the complete thermal analysis process from geometry creation, radiative and thermal analysis, and post-processing of the thermal results. For a full description of all the functionalities and improvements, please read the Release Notes. To enable the accurate modelling of pipe work, a new geometry primitive is now available. A shell or solid torus can be defined to represent pipe bends and - in addition to the standard methods for creating geometry - two additional interactive methods are provided within Workbench. ESATAN-TMS provides a powerful geometry modeller, allowing hierarchical definition of the geometry and the definition of translations and rotations at any point in the hierarchy. ESATAN-TMS 2018 provides the ability to select any point in the hierarchy (combination, assembly or cut) and move any transforms defined at the selected point, assigning the resulting combined transform to the low-level geometry primitives. ESATAN-TMS 2018 provides the ability to directly rename all entities. In addition, Workbench provides further flexibility by supporting renaming of multiple entities, including the option to provide a base name or define a prefix/suffix to prepend/append to the existing name. ESATAN-TMS 2018 provides much more control of the visualisation, allowing easy display of geometry associated with selected entities. In addition, individual faces can now be visualised rather than the display of the complete primitive. This additional level of control of the visualisation greatly simplifies model definition, model validation and post-processing of results. 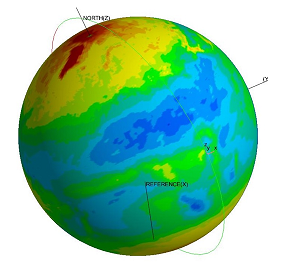 In certain radiative analysis, it is required to model a variation of the planet albedo reflectance and ESATAN-TMS 2018 allows the definition of a planet albedo map. During the radiative exchange and heat flux calculations, the variation of planet albedo is taken into account. To meet customer projects requirements, ESATAN-TMS 2018 supports the definition of surface optical properties that vary with respect to the incident angle of radiation. The optical properties are evaluated during the radiative analysis at a given angle, and angle-dependence taken into account within the radiative exchange factor and heat flux calculations. Thermostatically controlled heaters are common devices within a thermal model and ESATAN-TMS 2018 extends the modelling capability, including the ability to specify the steady state behaviour separately to the transient behaviour. Workbench now supports the initialisation of the temperatures of the complete model from the results from another case. The temperatures are loaded from the selected case at the start of the thermal solution and the thermal nodes initialised. To enhance the performance, data generated from Workbench Properties is now stored within the Analysis Case Definition (ACD) file, rather than the analysis file. For example, time- and temperature-dependent Properties, This significantly improves both the performance of the thermal solution and reduces associated file sizes. Workbench provides an effective environment for defining, running and post-processing a thermal model. ESATAN-TMS 2018 extends the capability further by launching the thermal analysis process in the background, allowing the monitor to be relaunched at any point to assess the progress of the solution. ESATAN-TMS 2018 enhances the environment for the development of the thermal model by providing additional control of the thermal node number and new and extended displays to facilitate validation of the model. The charting capability, introduced within ESATAN-TMS 2017, has been extended to provide two new chart types; a Delta Chart and a Limits Chart. The Delta Chart provides easy comparison of result data from different cases, presenting the selected results versus time and the difference between the results. The Limits Chart provides a way to compare the minimum and maximum values reached over all time steps against user-defined limits.